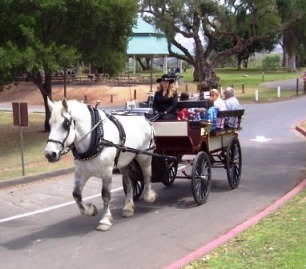 Carriages of San Diego welcomes you! Carriages of San Diego is a professional company specializing in horse-drawn carriage and wagon service throughout San Diego County in Southern California. 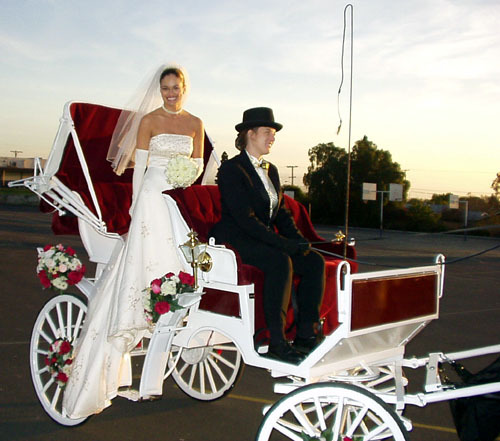 We look forward to helping make your dreams come true with our horse and carriage for your romantic wedding. Enjoy a one-of-kind experience to last a lifetime! We provide service to many locations throughout San Diego County including Lakeside, Poway, Santee, Rancho Bernardo, La Jolla, Del Mar, El Cajon, La Mesa, Chula Vista, Coronado and other Southern California locations. 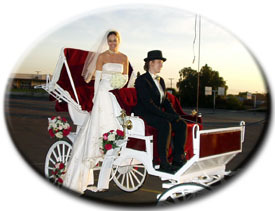 Choose between our white wedding carriage or wagon depending on your event. Basic and deluxe packages are available. Check out our web offer for special discounts we offer to preferred venues and locations. We're pretty busy at certain times of the year and may not answer right away. If you call 619-630-5595, please leave a message. You may find it easier to fill out our online form.